It was 1993 at the World Toy Fair in New York City. 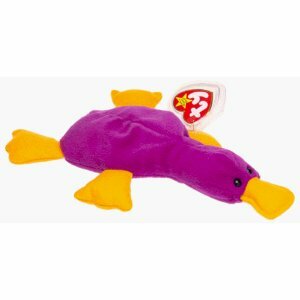 Nine small, plush-like toys were introduced to the world, styled in various animal forms. 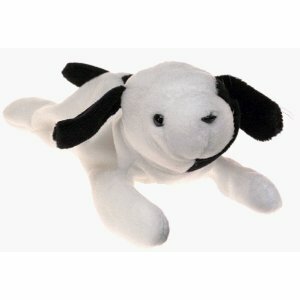 But these were plush toys with a slight difference in that instead of the usual stuffing which previously filled children’s plush toys, these would be partially filled with PVC plastic pellets, nicknamed “beans”, giving a unique appearance. This gave you the ability to pose them in various different ways. These bean-filled animals would become what is now known as the “Original Nine” Beanie Babies. 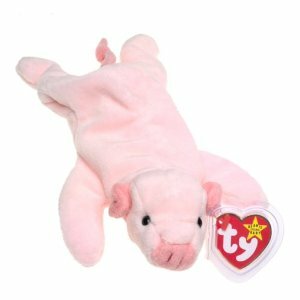 Originally the critics were sceptical of their appearance, giving them horrific nicknames like “road-kill” due to their somewhat flattened appearance when lying down, but little did they know that Beanie Babies would be a worldwide phenomenon! At first, they didn’t catch on, but when they did, they were a global success! 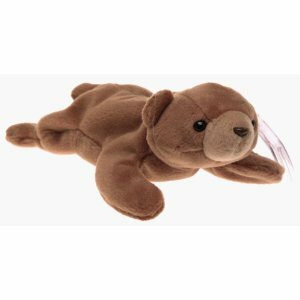 Millions of Beanie Babies were sold around the world, with hundreds of different characters coming on to the market. Ty had a simple marketing strategy, and that was to keep it simple! Each character would only have a few colours of fabric and simple facial features. 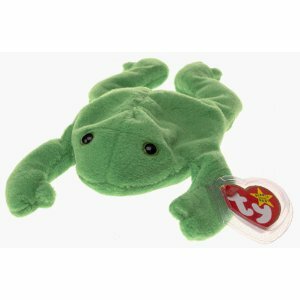 Every Beanie Baby adorned a red heart swing tag with the word “Ty” on the front in white. The first generation tags were simple double-sided tags with the name and style number written on the rear. Poems weren’t introduced until the fourth generation of swing tags. Tush tags were small fabric tags which initially were white with black lettering (later changed to red lettering) and were attached to the Beanie Baby’s rear end. A dark brown moose with orange antlers, Chocolate did not receive a poem until he was released with a 4th generation swing tag. 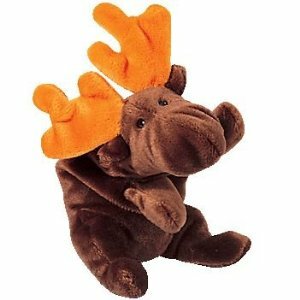 The poem suggests that his favourite treat is chocolate, and you’ve got to love the pun, Chocolate Moose! Chocolate was one of the last of the Original Nine to retire, doing so on 31st December 1998. Poor Cubbie. I’m not quite sure what’s funny about being stung by fourteen bees. Actually Cubbie wasn’t really his original name. When the cute little brown bear was first introduced, it was under the name “Brownie”. Shortly after it’s release, Brownie was retired and was re-introduced as Cubbie. The two are identical in every way except for the name difference. Cubbie went into retirement on 31st December 1997. It is indicated that Flash the Dolphin and Splash the Whale are good friends, with Splash being the one who taught clever Flash to read. The adorable grey dolphin has her birthday on 13th May 1993. Flash and Splash were retired together on 11th May 1997 and Echo the Dolphin took her place. Legs is a bright green coloured frog who was introduced 8th January 1994. His eyes were slightly different to the other Original Nine, in that they were black buttons with a green ring around the edge. According to his poem, Legs loves to play leap frog and hang out by the lake. His birthday is on 25th April 1993. Legs was one of the easier of the Original Nine to get hold of with him being available all over the place. He was retired on 1st October 1997. Patti has had four different colour changes in her lifetime! She was originally released in a magenta, almost red colour but has also been fuchsia, maroon and raspberry! She was born on 6th January 1993 The original magenta version is incredibly rare and fetches a lot of money when sold. Pinchers was originally released under the name “Punchers”. This is thought to be a spelling error as Punchers was quickly retired and came back as Pinchers. 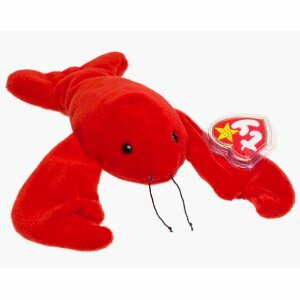 He is bright red in colour with cute black button eyes and black thread antennae. 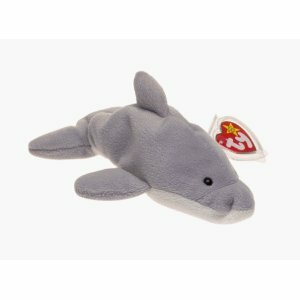 Pinchers was also later released as a McDonald’s Teenie Beanie and a Beanie Buddy. Pinchers’ birthday is on 19th June 1993 and didn’t retire until 1st May 1998. 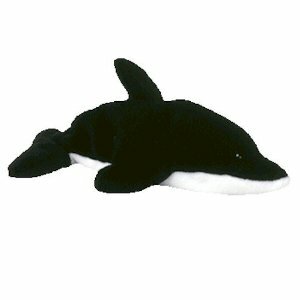 Splash is a black and white orca whale who was introduced on 8th January 1994. He makes a great pair with Flash the Dolphin as according to Flash’s poem, Splash was the one who taught her to read. He has the signature black button eyes. Splash was one of the first of the Original Nine to be retired and did so on 11th May 1997. Spot was strangely first released missing a spot. This “spot-less” Spot was quickly taken off the market and later re-introduced with the spot. The version with the missing spot is one of the most valuable and sought after Beanie Babies around. Spot is a white coloured dog with black ears, a black patch on the left side of his face and the majority of those released have a black spot on his back. Spot was retired on 1st October 1997. Squealer was introduced to the market on 8th January 1994. He is a pale pink pig with a slightly darker pink snout, ears and curly tail. His cute little black button eyes are just calling out for a cuddle. He was one of the longest running of the Original Nine, only retiring on 1st May 1998. His birthday is on 23rd April 1993.